A Web Site by W. F. O'Rourke Today is . Israel's population and area are roughly equal to the population and area of Alabama. Try to imagine what would happen if there were a fatal terrorist attack every day in Alabama or Mississippi or Maine or New Hampshire or Oregon. The terrorist slaughter still goes on. So why would anyone would think that peace is at hand for Israel? Skip the news tickers, and go to the Site Guide. Below is a map of Israel. Notice that the West Bank is a huge area right in the middle of Israel. The occupied Gaza Strip in the south-west and the occupied Golan Heights in the north-east are smaller areas but are important strategically to Israel's enemies. To return to this page from any link on this page, you have to use your browser's "Back" button. 6. Is There a Solution? Now Arafat Claims He Favors an Israeli State!!! And (Get This!) Sharon Now Favors a Palestinian State!!! but the Israelis have serious doubts about that. At the top of this page is a map of Israel. A basic familiarity with the geography of the area is helpful; however, understanding the situation is not so easy because the conflict between Palestinians and Israelis is crazy! Rather than settle their differences and live in peace, the two sides continue to risk complete destruction and the rest of the world puzzles over why the violence continues. In the area we today know as Israel the crazy enmity between Arab and Jew has been simmering for several thousand years. And that simmering pot has boiled over so many times in the past that it is no surprise to learn that Israeli troops and tanks are on the move again, that suicide bombers are blowing themselves up on Israeli buses and in Tel Aviv nightclubs, that American newspapers and magazines are chock full of stories about Arafat, Sharon, and the latest suicide bombing, and that American diplomats are once again trying to promote peace in the area by trying to stop the current fighting and trying to force the two sides to develop a long-range peace plan. Well, good luck to the diplomats! We hope they are successful, but we also know there are many reasons why no plan for peace is likely to end that conflict. Even as I was typing this on May 1, 2002, a gun battle between Israeli soldiers and Palestinian gunmen holed up in the Church of the Nativity had left that famous site in Bethlehem in flames, and when I was editing this site on May 8, 2002, the news was all about a suicide bomber who killed himself and 15 Israelis. Indeed, since the current wave of violence began in 2000, at least 1400 Palestinians and at least 700 Israelis have died as a direct result of all the terrorism and military action. Sharon's proposal. Return to site guide. Yes, there are many reasons why it very nearly impossible to solve the problem of Israeli/Palestinian violence, but in these remarks I will concentrate on the only most important ones. Some of these reasons are religious; some of the reasons are historical; some of the reasons have to do with the personal attitudes of such leaders as Israeli Prime Minister Ariel Sharon and PLO Chairman Yasser Arafat; and some of the reasons have to do with future issues that will cause conflict between the two sides. The details of the struggle are enormously bewildering, but in the following paragraphs I will try to give you enough information to understand what is going on in the area and to understand why we should not be too quick to believe that there will ever be peace in that part of the world. As Christians we believe that all problems can be resolved by God, and it may be that we will have to trust God on this one; for as you will see below, even though individual Palestinians and Israelis object to the constant bloodshed and destruction, there are so many other obstacles to a human solution to this conflict that it is very close to impossible to see how a lasting peace can ever come to that region of the world. To begin with some religious issues, it is important to understand that Palestinian Arabs and Israelis are like two rival heirs to Abraham's estate. That is, both sides claim to be descended from Abraham; and both sides believe they themselves are the "true" and "legal" descendants of Abraham. The Arabs are descended from Abraham through his first son, Ishmael the traditional figure alleged to have founded the Arab ethnic group. 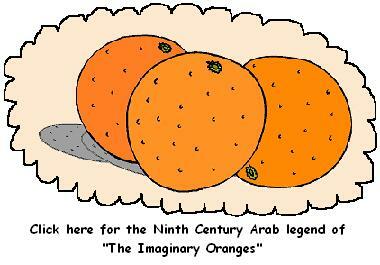 According to the Arab view of things, Abraham had officially named his first-born son Ishmael as heir to his estate. Therefore, the land that God promised to Abraham should have been inherited by Ishmael and his descendants. But the Jewish interpretation is quite different. Because the first-born son Ishmael was the son of a maidservant to whom Abraham was not married, the Jews view Abraham's second son Isaac as the legitimate heir to the promised land. In other words, the Jews feel that the true son of the true marriage of Abraham and Sara has the right to inherit over the older boy even though the older boy was legally recognized as Abraham's heir. (If you want review these events as related in the Old Testament, please click here, and use "Abraham" as your search keyword. You will need to use your "back" button to return to this page.) As a legal problem, it's impossible for either side to see any justice on the other side, and attempts to resolve differences on this basis end up in angry arguments just as often happens when siblings fall to arguing over matters of inheritance.. If you would like to print the text of this page, click here to obtain non-graphics version. Click on this image to go to CIA Fact Book. An almanac of factual info on the Internet. Find statistics about all nations on earth. Return to site guide. Click on Alfred E. Neuman to see why we should be concerned about the conflict. As World War One ended, England found itself responsible for administering the Palestinian territory. It was called the Palestinian Mandate, but that area is roughly the same area that we know as Israel today. About 80 percent of the population of Palestine around 1920 were the Arabs who called themselves Palestinians; somewhat less than 20 percent of the people were Jews. Although they hated each other and had frequent violent clashes, both the Palestinians and the Jews wanted the British to leave..
politics influences the Israeli/Palestinian conflict. Nevertheless, by one means or another, a steady stream of Jews came into Palestine (especially after World War Two when there were thousands of Jewish refugees from Europe seeking a new life). By 1947 the Jewish population had come to be about 40 percent of Palestine. It was inevitable that the two rival groups inside Palestine would continue to feel mutually threatened, to harden their hearts against one another, to attack each other verbally, to build up secret supplies of small arms and ammunition, and to conduct terrorist attacks on their rivals. Only the presence of the British in Palestine prevented a full-scale civil war between these two groups..
to enter the Photo Gallery. So we have reviewed some religious reasons and some historical reasons why the conflict is so hard to resolve. But equally important is the intense personal hatred that exists between the leaders of the two factions. Ariel Sharon, the Prime Minister of Israel, and Arafat, the head of the Palestinians, have been personal, mortal enemies for over 50 years. 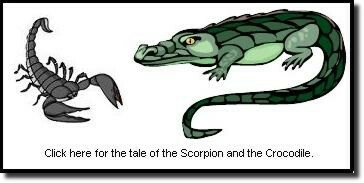 Now in their early 70's, they have been fighting each other since they were both teen-agers back in the late 1940's. And, while it is tempting to believe that the removal of one or both of these two old guys might be a step towards peace, the fact remains that there are so many other reasons for strife between the two sides that there is almost sure to be continued trouble no matter who leads either side. 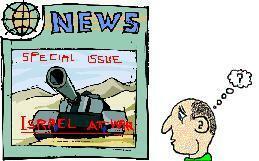 recent political cartoons about the Middle East Conflict. future of theIsraeli/Palestinian conflict. Return to site guide. I realize that these remarks are extremely pessimistic. So I have turned my attention to trying to see a reason for hope. Frankly, I don't think that I can do any better than to merely list the pre-conditions that might lead to a hopeful outcome in the conflict. for Mister O's personal opinion. Arafat must be replaced by a leader who is committed to educating the Palestinian people. There are no more than 30 percent of the Palestinians who are even literate. I know that my faith in education is a result of 40 years spent as a teacher, but I am convinced that an educated Palestinian populace would be far less likely to accept martyrdom as a desirable goal in life. Fewer illiterates would mean fewer suicide bombers, fewer people who could be manipulated by the Arafats of the world, fewer people who are caught up by the Arab tendency to use verbal deception as a bargaining technique, and more people who are able to see that there are two sides to the conflict. 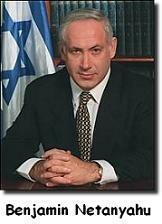 Next, the Israelis must abandon the practice of electing former generals as prime minister. Generals generally (forgive the pun!) believe that intractable problems can be solved by breaking things and killing people. But, as we can see, that condition is difficult to achieve because nearly every adult Israeli is a military veteran and nearly every major political figure is proud of having served as a high-ranking military officer. log book on the most recent suicide bombings in Israel. Return to site guide. Somehow the Palestinians must be brought into the 21st Century. Everyone in that part of the world needs to be involved in "making the desert bloom." Ideally, what I would like to see is Palestinians being trained as engineers and scientists and to see those new technical people working on problems like improving the water supply and building an economic infrastructure for the West Bank and Gaza. And are there any signs that such preconditions may may be met? Well, there is a growing "peacenik" movement in Israel, and there are certain to be new leaders of the factions soon. 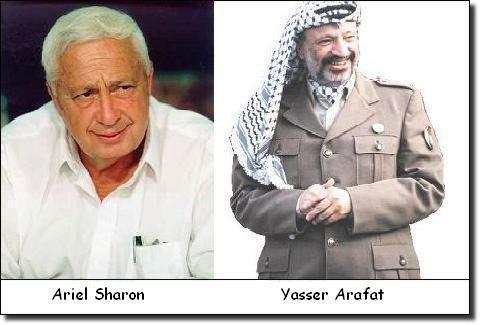 Sharon and Arafat are old men. Also there is a growing awareness that the water supply problem needs serious attention since the principal source of fresh water for human consumption is the Sea of Gallilee, a body of water is rapidly approaching a critical degree of pollution. This is a complete historical account. This is a biography of Ariel Sharon. It points out why the Palestinians hate him. This is a short biography of Yasser Arafat. This site gives the best guess at Israel's nuclear aresenal. Apparently the Israelis have about 200 atomic bombs that they would use if it appeared they were about to be engulfed by their Arab enemies. Here are complete lists of prime ministers, presidents, ministers of defense, and so forth. Most of these people in the lists have picture links. This the U.S. State Department's guide to active Terrorist groups around the world. This is a place where you can look up groups like Hamas and Al-Fatah to see what they have been doing lately. This is a serious scholarly work on suicide terrorists. If you want to really understand what has been happening in Israel, this is a must-read link. This is also a rather large site I created to support my work with international students. In it you will find my own personal profiles of various countries that have sent students to Jefferson State.